I’m a huge fan of the $20 Capo app on the iPhone, which lets you easily learn songs from your iTunes library by slowing them down, changing the pitch, and more. But Capo didn’t originate on iOS—it's been a Mac app since 2009. And with SuperMegaUltraGroovy’s Monday release of Capo 3 for OS X, I figured I should finally give the Mac version a spin. 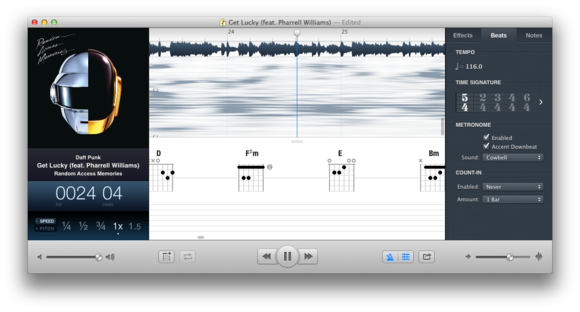 Capo for OS X has all the features I loved in iOS—voice reduction, speed and pitch modulation, and clean, easy-to-see song waveforms—with a ton of additional tweaks. 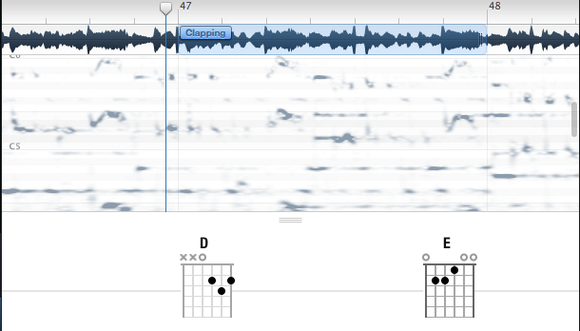 Capo 3’s new addition is automatic chord detection: When you import a song, the application automatically maps out chords for your guitar, bass, mandolin, ukelele, or banjo; you can move the chord earlier or later in the song by dragging on it, and change it to a different variation or another chord entirely by double-clicking. Capo 3's chord detection is fantastic, though you can always change the chord variation or the chord itself if you prefer a different sound. 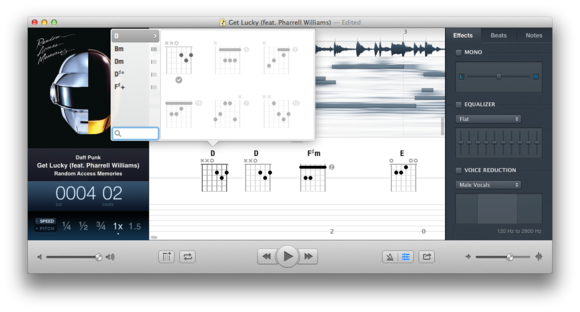 Capo 2 for the Mac offered manual chord detection, but Capo 3’s implementation is nearly flawless—occasionally chords appeared a beat or two after I’d want to switch to them, but they were almost always the correct chord. 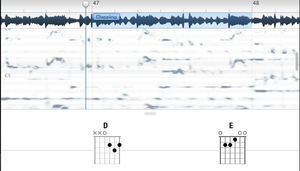 For tablature lovers, Capo 2’s spectrogram returns, letting you draw on top of it to manually generate tabs. Capo 3 also offers beat detection and a customizable metronome: This means that you can not only change your song’s time signature, but you can view and hear that change with an audible metronome (sounds include the traditional metronome in addition to a rim click, square click, wood block, and even some cowbell). 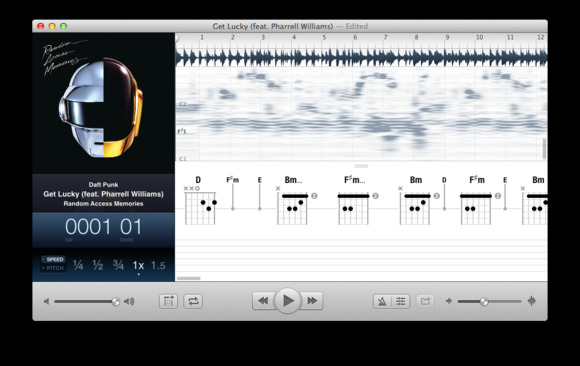 You can have all the cowbell you want with Capo 3's metronome. Capo’s speed and pitch controls on iOS always seemed magic to me, and Capo 3’s chord and beat detection are no different—they work flawlessly, you can change them in real-time, and they make it ridiculously simple to learn your favorite song. Goodbye, scouring the internet for chord tabs. Capo 3 also abolishes the familiar A and B markers found on iOS and in previous Mac versions for a new region marking system. I found this leagues better to use—all you have to do is drag your cursor over a section of waveform, and you get a blue overlay with the word region on top. You can adjust a region after you’ve made it, name it (“Stupid chord progression #1”), and you don’t even have to abolish it when you want to move—leave the region as is and highlight a second one to work on next. The thing I like most about Capo is how easily it invites you to play around with otherwise-complicated musical notation. Its interface manages to pack in all sorts of helpful features without ever intimidating users; it’s the type of program I’d recommend both to master musicians and the kid who’s picked up her first guitar. I do wish that Capo 3 had taken a page from its iOS app and made it easier to import music directly from iTunes—on the Mac, you must either drag and drop a music file from the Finder or open iTunes and drag a (not-stored-in-iCloud, downloaded) track to Capo; seems like there must be an easier way to tap into your music library, but I can’t say for sure. Capo 3 is just $10 more than its iOS counterpart ($30 on the Mac App Store or direct from SuperMegaUltraGroovy’s website); there’s also a free trial available on the Capo website.